Computer simulation is the key to comprehending and controlling the full-scale industrial plant used in the chemical, oil, gas and electrical power industries. Simulation of Industrial Processes for Control Engineers shows how to use the laws of physics and chemistry to produce the equations to simulate dynamically all the most important unit operations found in process and power plant. The book explains how to model chemical reactors, nuclear reactors, distillation columns, boilers, deaerators, refrigeration vessels, storage vessels for liquids and gases, liquid and gas flow through pipes and pipe networks, liquid and gas flow through installed control valves, control valve dynamics (including nonlinear effects such as static friction), oil and gas pipelines, heat exchangers, steam and gas turbines, compressors and pumps, as well as process controllers (including three methods of integral desaturation). The phenomenon of markedly different time responses ("stiffness") is considered and various ways are presented to get around the potential problem of slow execution time. The book demonstrates how linearization may be used to give a diverse check on the correctness of the as-programmed model and explains how formal techniques of model validation may be used to produce a quantitative check on the simulation model's overall validity. The material is based on many years' experience of modelling and simulation in the chemical and power industries, supplemented in recent years by university teaching at the undergraduate and postgraduate level. Several important new results are presented. The depth is sufficient to allow real industrial problems to be solved, thus making the book attractive to engineers working in industry. 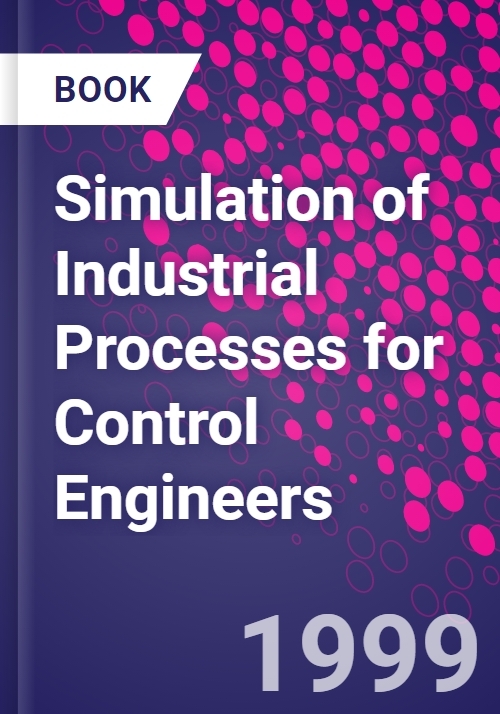 But the book's step-by-step approach makes the text appropriate also for post-graduate students of control engineering and for undergraduate students in electrical, mechanical and chemical engineering who are studying process control in their second year or later. simplified model; Turbo pumps and compressors; Flow networks; Pipeline dynamics; Distributed components: heat exchangers and tubular reactors; Nuclear reactors; Process controllers and control valve dynamics; Linearization; Model Validation; Appendices: Comparative size of energy terms; Explicit calculation of compressible flow using approximating functions; Equations for control valve flow in SI units; Comparison of Fisher Universal Gas Sizing Equation, FUGSE, with the nozzle-based model for control valve gas flow; Measurement of the internal energy of reaction and the enthalpy of reaction using calorimeters; Approximations used in modelling turbine reaction stages in off-design conditions; Fuel pin average temperature and effective heat transfer coefficient; Conditions for emergence from saturation for P + I controllers with integral desaturation.